A LASTA-95 of the Serbian Air Force at Batajnica air base. The second prototype of Lasta 95 lightly armed basic trainer aircraft on display at Partner 2011 military fair. Image courtesy of Kos93. Cockpit view of the LASTA-95 advanced trainer aircraft. Image courtesy of Kos93. A Lasta-95 trainer aircraft from Serbian Air Force performs flight during a military exercise. Image courtesy of Kos93. The tandem cockpit seating of Lasta-95 trainer aircraft accommodates two crew members. Image courtesy of Boksi. LASTA-95 is an advanced trainer aircraft manufactured by UTVA. The aircraft is intended for primary and basic pilot training, acrobatics, and formation flying. Yugoimport-SDPR, an arms export company based in Serbia, is marketing the LASTA-95. LASTA-95 is an ideal trainer platform for full pilot training including basic flying, figure flying, navigation flying, instrument flying, and night flying. It can also be deployed in homeland security, light close air support, patrol and light attack missions. 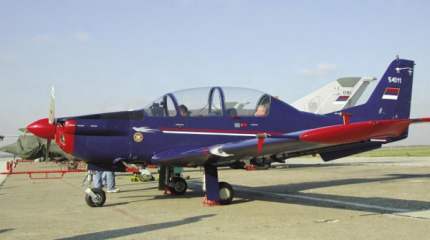 The first LASTA-95/LASTA 3 prototype trainer made its first flight in February 2009. This aircraft is derived from the LASTA-1 and LASTA-2 prototypes. LASTA-95 complies with federal aviation regulations. In December 2007, Iraq placed a contract with Yugoimport for 20 LASTA-95 armed variants plus 15 options. The Iraqi Air Force received its first three aircraft in August 2010. The Serbian Air Force also ordered 15 LASTA-95 aircraft to replace its ageing fleet of MiG-21. The first two aircraft were delivered in October 2011. Designed by the military technical institute (VTI), LASTA-95 is a tandem-seat, low-wing aircraft. The metal shell design incorporates a vertical tail and a truss engine. The two-spar wing and horizontal tail wing are of metallic construction. The weight reductions were achieved by employing advanced stress calculation techniques. LASTA-95 has an overall length of 7.9m, a wing span of 9.7m and a height of 2.84m. The wing area of the aircraft is 12.9m². The maximum take-off weight of a LASTA-95 in utility category is 1,210kg. "The LASTA-95 accommodates two crew members in tandem cockpits under individual canopies." The LASTA-95 accommodates two crew members in tandem cockpits under individual canopies. The ergonomic seating arrangement was designed in accordance with military aircraft standards. It provides comfortable accommodation for 99% of pilots. The front seat is well placed to provide direct visibility of approaching runways. The height-adjustable pilot seat accepts a back-carried pilot parachute. The rear seat is provided with a minimum headroom of 100mm. The aircraft is equipped with a modern avionics suite. The Serbian Air Forces’ LASTA-95 aircraft are fitted with Garmin G500 avionics suites, which include primary flight display (PFD) and a multi-function display (MFD). The aircraft also integrates an instrumental flying simulation system. The G-4 Super Galeb is a single engined, two-seater modern trainer and ground attack aircraft that was designed and manufactured by the Soko Aircraft Factory of Bosnia. The very-high-frequency (VHF) two-way radio communication ensures the uninterrupted flow of all audio signals in each cockpit and enables communication between the two pilots. The aircraft can be optionally integrated with a UHF transceiver. The satellite and radio navigation systems include satellite navigation receivers and a ground radio beacon, VHF omni-directional range (VOR) and radio compass. The onboard GPS and Instrument Landing System (ILS) support the operations during CAT-II weather conditions. The aircraft is equipped with Mode S transponder for flight identification. The armed variant of LASTA-95 aircraft can be installed with collimator sight to perform combat training missions using its guns, rockets and bombs. The aircraft can be optionally equipped with optoelectronic sight to employ onboard airborne ordnance. The aircraft pods can be mounted with 7.62mm/12.7mm calibre machine guns, Honeycomb-type 57mm multiple rocket launchers and two 100kg aerial bombs. "The LASTA-95 can fly at a maximum altitude of 6,000m"
LASTA-95 is powered by a Lycoming AEIO-540-L1B5D single piston engine driving Hartzell twin-bladed, variable pitch, constant speed propeller. The engine delivers a maximum continuous power output of 220kW at 2,700rpm. The aircraft can be optionally equipped with Lycoming AEIO-580-B1A 235kW engine. The retractable tricycle landing gear of Lasta-95 allows operations on concrete and prepared grass runways. The hydraulically operated landing gear can be extended using mechanical actuators in case of failure of hydraulics. The mechanical system allows extension and locking of all three struts in unfolded position at speeds of up to 180km/h. The LASTA-95 can fly at a maximum altitude of 6,000m. It can climb at a rate of 8.5m/s. The maximum and never exceed speeds of the aircraft are 320km/h and 390km/h respectively. The maximum range without fuel reserve is 1,160km. The aircraft can conduct non-stop flight for a maximum duration of three hours. This project forms part of our recent analysis and forecasts of the global military aircraft market available from our business information platform Strategic Defence Intelligence. For more information click here or contact us: EMEA: +44 20 7936 6783;Americas: +1 415 439 4914; Asia Pacific: +61 2 9947 9709 or via email.